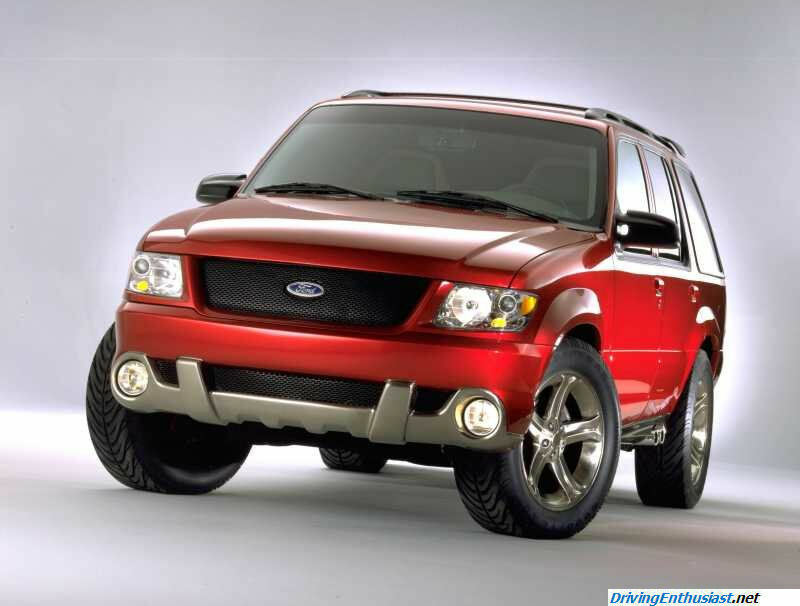 The SVT Tremor Concept was introduced to the public at the 1998 NAIAS in Detroit. It is a concept only, with no production plans even remotely possible. The concept was very well received; AutoWeek reported at the time that many people offered deposits if production was planned. 2001 Update: as we found out much later with the launch of the all-new 2001 Explorer, the Tremor previewed a new and far more sophisticated direction for the then-future Explorer. The new 2001 Explorer chassis debuts a coil-over independent suspension at all four corners. The Tremor’s 5-valve DOHC 4.6 liter V-8 with 380 HP was never seen again; one of two prototype engines built was grenaded at the Dearborn proving grounds and the other is in a museum in the Ford Romeo engine plant. 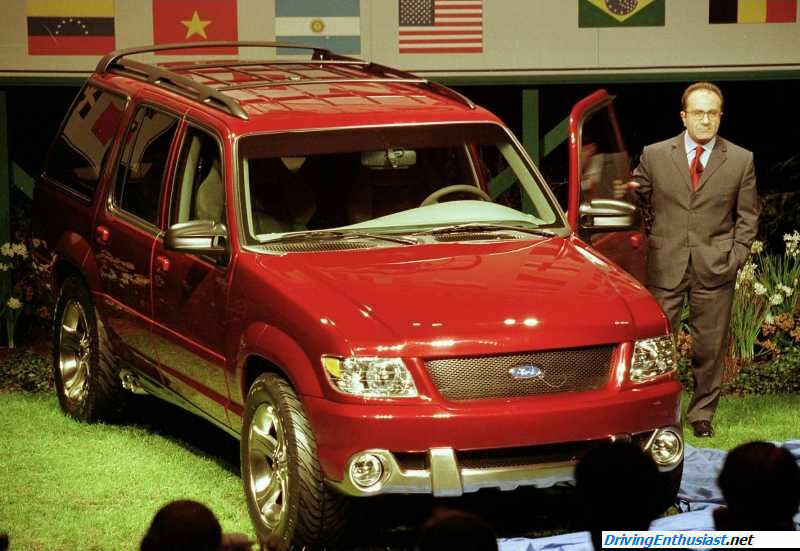 And with the introduction of the 2001 Explorer, it was clear that the Tremor could never and would never have been built on the “old” solid-axle Explorer chassis, a chassis that dates back many many years and was coming to an end. 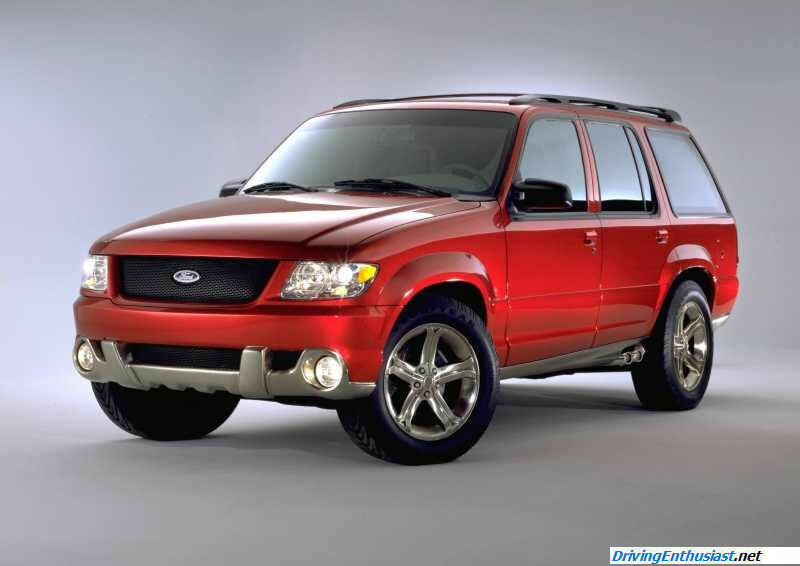 The Ford Tremor breaks new ground in the sport utility market. With its high-performance 4.6-liter DOHC five-valve engine, independent rear suspension, all-wheel drive and aggressive looks, this concept sport utility vehicle (SUV) is at home on the street or ready for off-road adventure. At the heart of the Ford Tremor is a powerful, all-aluminum 4.6-liter five-valve DOHC high-performance engine capable of delivering an estimated 380 horsepower and 340 foot-pounds of torque at 5,500 rpm. The engine was built by Ford’s Advanced Powertrain group. Though the performance characteristics have not been fully evaluated, computer-aided engineering simulations suggest the engine will power the SUV to a top speed of nearly 140 mph, an under-seven-second 0 – 60 mph time and a quarter-mile time under 15 seconds. The cylinder heads were designed by Yamaha and feature five valves per cylinder — three intake and two exhaust — that open and close in harmony through variable camshaft timing on intake. Variable camshaft timing provides 12 degrees of cam rotation overlap, increasing midrange power and reducing emissions without sacrificing smoothness at idle and low speeds. The engine compression ratio is 10.5:1. The transmission is a modified Ford 4R70W four-speed automatic with a unique calibration. A Lincoln Mark VIII 11.25-inch torque converter has been adapted with revisions to the impeller and turbine to handle the high engine revs. The all-wheel-drive transfer case comes from a 5.0-liter Explorer and has a heavy duty input shaft. A custom driveshaft connects the transmission to the rear axle. Both front and rear axles run 4.10 gearsets. The Tremor’s chassis and suspension are engineered to provide optimized handling characteristics, without compromising the refined ride quality associated with the Explorer. The fully independent rear suspension (IRS) has been adapted from the latest version of the Ford Thunderbird. The 9-inch Thunderbird IRS was chosen because of its excellent durability and reliability, making it an ideal candidate for the Tremor’s street and off-road performance needs. The rear suspension system was designed in cooperation with Multimatic Inc. of Ontario, Canada, and includes upper lateral links, lower H-arms, toe-in compensating links, coil springs and two-way adjustable gas shock absorbers. A rear stabilizer bar minimizes roll, and two box-sections house the IRS subframe rails that reduce torsional bending. Even with the significant changes to the suspension to improve its dynamics on the road, Tremor’s off-road handling and ground clearance have not been compromised. Ford’s Advanced Design Studio is responsible for Tremor’s design. “We wanted to combine a rugged exterior appearance with a high-quality interior that gives the Tremor a performance look but also a sophisticated quality feel,” said Tom Scott, director of the Advanced Design Studio. The front end features a new hood and fenders made from lightweight composite materials. A large grille opening keeps the 4.6-liter V-8 cool even under the most demanding driving conditions. Four large round high-performance headlamps, plus two round fog lamps in the front bumper, emphasize its sporty, purposeful character. The wheel arches, with crisply defined edges, have been expanded to accommodate the 19-inch wheel and tire combination. Twin exhausts exit from beneath each side valance, signaling the vehicle’s performance capability. Tremor’s rich metallic red paint is enhanced by the addition of nickel chrome protection panels on the lower body. The rear end has been extended slightly and the backlight sloped to give the vehicle a sportier profile. The license plate mount has been moved from the bumper to the tailgate and combined with a new integrated tailgate-opening handle. An innovative Jac Products Inc. roof rack and a rear roof spoiler help to improve stability. The large, five-spoke aluminum wheels have been positioned at the far edges of the chassis, helping to give the Tremor its dramatic stance. The wheels measure 19 x 8.5 inches, and feature 245/60 R19 Goodyear performance tires specially made for the vehicle. The wheel and tire combination ensures maximum traction whether on- or off-road. Stopping power is provided by Mustang Cobra ABS system 13-inch vented discs on the front and 10.1-inch vented discs at the rear. The Explorer is well-known for its interior packaging, and the Tremor concept follows this tradition but with a more performance-oriented theme. Four custom leather-covered Lear bucket seats hold the driver and three passengers firmly yet comfortably in position during even the roughest off-road driving. Grab handles are located near each seat for when the going really gets tough. A full-length center console extends from the instrument panel to the rear bucket seats and houses the floor-mounted shifter, with storage space for a telephone. A new Garmin global positioning system is integrated into the instrument panel but is easily removed to be used outside the vehicle. Rear passengers have their own climate controls and an armrest, first seen in the Ford Taurus, that can be folded down to provide additional storage space. For added convenience, the rear seats fold flat for cargo-carrying capacity. The cargo area floor is covered in a durable, non-slip rubber matting for maximum utility and durability. While Tremor is only a concept at this stage, it has been engineered as a fully driveable prototype. The Ford Tremor performance SUV will be shown at auto shows throughout the year.